I’ve had a love affair with music since I was a kid. I can’t remember a time when music wasn’t a huge piece of my life. And because of that, I love running with music. 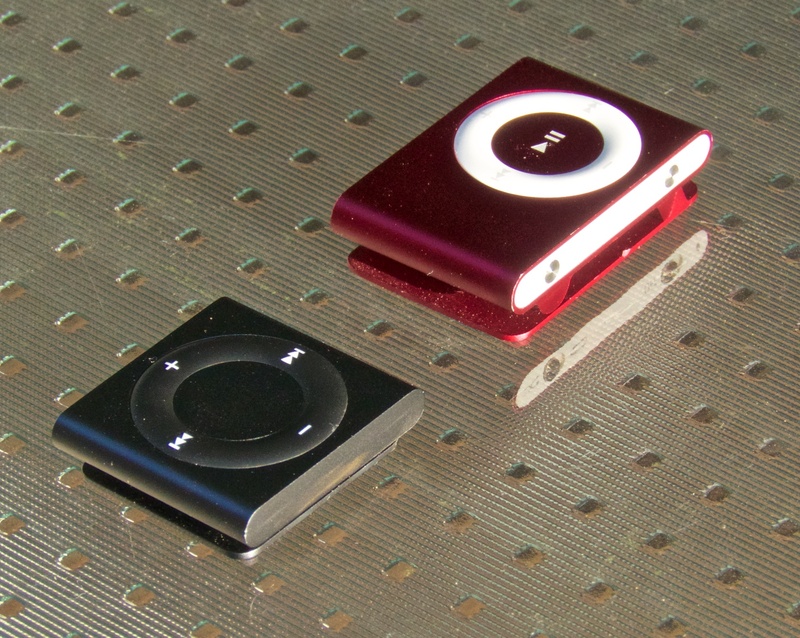 A long time ago, I picked up a tiny little iPod, the iPod Shuffle (2nd Generation) to carry music with me when I went cycling or traveling. I loved that little thing, and it still works very, very well to this day. However, as I’ve started to do more running, I’ve discovered that you cannot control that model of Shuffle with the on-cable controls — no volume adjustments, next/previous track, etc. When I’m running, I’ll find that a particular track at a particular time doesn’t hit me quite right, and I wanna skip it. Sometimes, I’ll find a track that was so good with my pace that I wanna repeat it. While you can do that from the front of the Shuffle, you sorta have to fiddle with it on your waistband or pocket, and that’s a little distracting to me. As I started to research, I got tangled up between the newer iPod Nano (I have an older one of those too!) and the newer Shuffle. The new Shuffle pays attention to those on-cable controls and is really teeny, but the new Nano had Bluetooth for headphones. I even bought some new Bluetooth running headphones to see if I could get them to fit my earholes and get used to them. No deal. You see, I love my Bose sport earbuds, despite being cabled. They fit my ears like they were custom made for them, and ultimately, that’s what made my decision easy. Shuffleland, here I came. A few things of note. First off, the price now is about half what I paid for my first Shuffle. They both only sport 2GB of storage, but with an option in iTunes, you can “down convert” files to 128kb/s, putting more music in the small space. Even at 128kb/s, the audio quality is fine for my old ears when I’m out running or riding, and 2GB has always given me plenty of variety when I’m out putting trails behind me. I was struck with the reduction in the size of the packaging. In the photo, you can see the difference in size between the little plastic coffins these two devices were shipped in. Apple’s gone to some lengths to minimize the amount of packaging in many of their products, and it really shows with the tiny little box for the new one. One casualty of that move — you only get one Apple sticker, instead of two. The charging system has also gotten smaller. 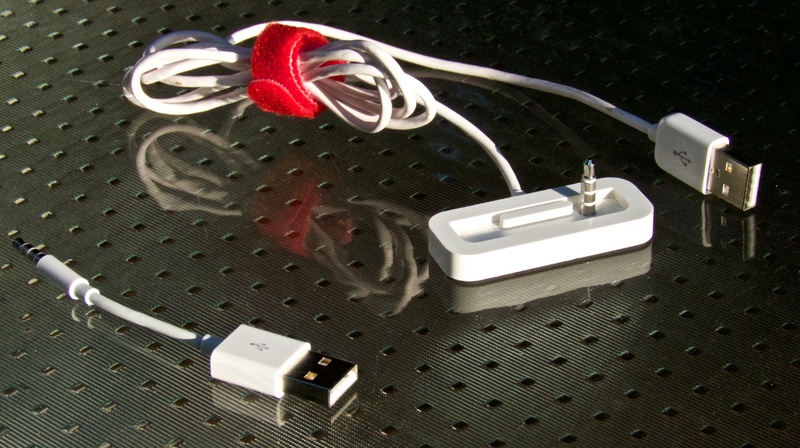 With the second generation device, there was a long cable and a little dock. The new Shuffle has a little pigtail cable that plugs directly into the headphone plug. I kinda like that, especially given that I’ll be traveling with this one to races around the country. In fairness, it is a little awkward to plug into the back of a Mac or iMac, but works great with my MacBook or a USB hub. So, after a couple of weeks of putting it through its paces, I think I’ve decided this new little piece of gear is a keeper. Hopefully, it’ll last as long as my first Shuffle! Today at noon (our time, anyway), Apple put a black t-shirt on Uncle Steve, and like Willy Wonka, he proceeded to extoll the virtues of all the new things we didn’t know we needed. Now on to the fun stuff. Beck, @braddog and I went to lunch — regular Wednesday occurrence for us — knowing that during lunch, Uncle Steve would begin the presentation. As it ends up, the place we frequent has apparently put in a wifi hotspot. Score! Apple had announced that they would stream this event live, so with the discovery of wifi, I set up my iPad to watch the keynote live. Jay had his iPad following the Engadget live text feed from the auditorium floor, and I did the same with my iPhone. Yes, it was geekapalooza. New iPods were all over the place. There was a refresh of the iPod Shuffle announced. Apple decided that the pill/hairclip/borg-implant format of the now-previous version of the Shuffle wasn’t exactly a big hit. I mean, there were no buttons on it anywhere. Aside from providing a mystery for our childrens’ childrens’ children when they cull through the landfills we left behind, there’s really no use for a device with no obvious interface. Enter the new Shuffle… or, is it the old Shuffle? It was really a back-to-the-future moment to see the new Shuffle rolled out, looking almost exactly like my old trusty red Shuffle. It’s a tad bit smaller left-to-right, but still sports the great big ol’ alligator clip on the back. Hurray! Nothing new for me though. Mine’s a 2GB, and I think the new one will go to 4GB. For what I use it for, there’s not much need for the extra capacity, Voice Over, Genius Playlists or any of the other new little things. 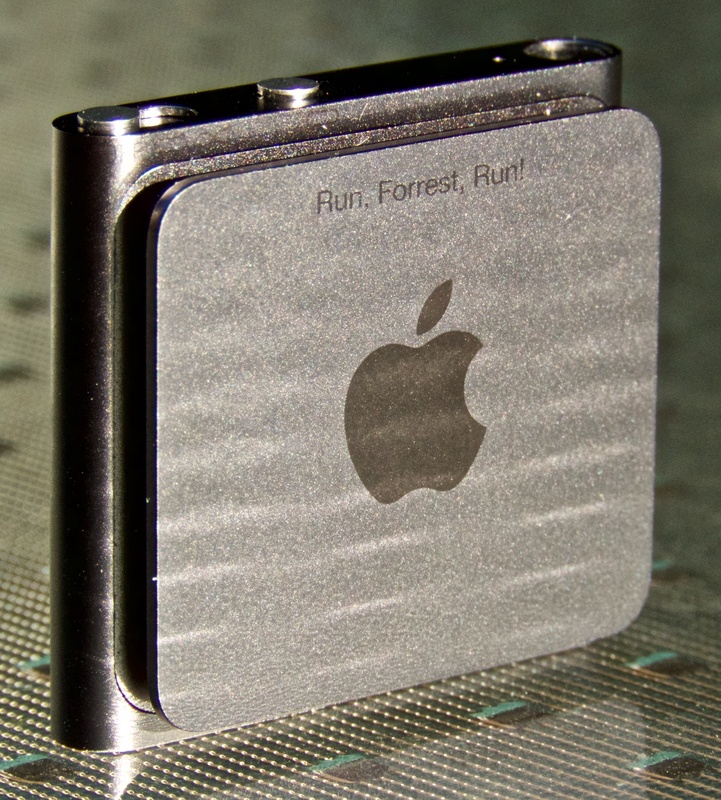 The refresh of the iPod Nano was definitely a cooler machine… kinda. About the size of an iPod Shuffle, the new Nano has no click-wheel, with everything controlled through a touch-screen interface on a teency screen. This one also has an alligator clip on it, which I think is a great addition for something that small. But — and there’s always a “but” — there are some missing features. The new Nano does not have a camera, leaving the Nano 5G as the oddball of the line for having one. I’ve also been led to believe that you can’t watch video on the new Nano. These are both kinda big things — philosophically — for me. Uncle Steve sold us on a Flip video killer last year with the 5G Nano, with the ability to shoot 640×480 video, as well as watch video shot with the thing or imported from iTunes. My guess is that the drop of the whole video concept has a lot to do with the success of the iPhone 4, and the introduction of the new iPod Touch. The new Touch has a front-facing camera for FaceTime video chat, as well as a rear facing camera (although my understanding is that it’s not as high resolution as the one in the iPhone 4). Cameras have been rumored for a looooong time on the Touch, and it’s nice to finally see them show up. The Touch also gets a high-resolution Retina display, just like the iPhone 4. I was disappointed though that the capacity wasn’t really increased from the current top end of 64GB. If I remember right, the original introduction of 64GB to the Touch happened mid-model year, so maybe an increase to 128GB will happen a little later. And to support all this, iTunes 10 was announced. Frankly, these are normally just updates to handle the new devices, but this time, there’s the addition of a social networking element to sorta tweet your music purchases, preferences and likes to an opt-in community of other music fans. This sounds kinda cool, but until I see it, my jury is still out. You see, I kinda expected to come home tonight, and be able to download it. No such luck so far. Even the iTunes site at apple.com is still sporting iTunes 9.2 with a “coming soon” for version 10. Uncle Steve probably said something about it not being available yet, but I missed that. The last big announcement — the “one more thing” moment — was an updated version of AppleTV. This product’s been around for a while, and has sorta been the stepchild of everything at Apple, being called the “hobby” by Uncle Steve. Well, no more. Basically, the new device is a streaming device for your TV, letting you rent streaming content (films and TV episodes) to your TV, stream content from iTunes on your computer, stream photos from iPhoto, and apparently loads of other new things. No storage, a quarter the physical size of the current Apple TV, and no power brick (man, everyone should get that message! ), all for $99. No subscriptions, no contracts. Way cool. And yes, I ordered one. It’ll be here in four weeks. At that price, it’s hard to make a mistake in picking one up, even if the thing is incredibly crappy, which I’m not expecting. Yeah, I know I haven’t mentioned AirPlay yet, but frankly, I’m not sure I understand enough of what it does to describe it yet. One thing it does seem to do is allow you to stream video or audio from your iPad, iPhone or iPod Touch to your TV through the AppleTV unit. That’s as much as I know about that one so far. Thumbs up on the return of the old iPod Shuffle design. Thumbs down for not increasing the capacity on the Touch. Thumbs up for HDR in iOS 4.1. Thumbs down for not bringing iOS 4 to the iPad until November. Half a thumb up for the new iTunes 10. Thumbs down for not having iTunes 10 available now! Two thumbs up and a toe for the new AppleTV. I think Uncle Steve wins! EDIT: iTunes 10 is available for download now!!!!! I was finally able to get video from my new iPod Nano to upload to YouTube. How’d I get there? In one of those notes, however, someone mentioned that they had success using their YouTube credentials, rather than GMail-based credentials. Sure ’nuff, that seemed to work. It’s a sample size of one, so YMMV, but below is our first video from the Nano to YouTube. Enjoy! There would be no camera on the iPod Nano. There would be no Beatles-related announcements. Jay was one for three. On Wednesday, Uncle Steve did appear on stage to a towering ovation, having beaten yet another life-threatening malady. He was still thin, and his voice sounded gravelly compared to a presentation he gave late last year, but he was still alive, much to the thrills of Apple’s shareholders, I’m sure. Frankly, I’m glad he made it. I think he’s a visionary, and maybe his shiny new liver will give him some shiny new ideas. After going through a ton of announcements, the event ended with “One more thing…” — a Jobs trademark, and frequently means that the best was saved for last. Conspicuous by its absence was any mention of the iPod Nano — Touch, Classic and Shuffle all got some love during the presentation, but nothing about the Nano. One more thing. Steve talked about video, and how handheld solid-state video devices were grabbing up a big chunk of the market. And he said Apple wanted a piece of the action. And they’re gonna give it to us for free. Enter the new iPod Nano, now outfitted with a camera that’ll shoot video at 480p at 30fps. The free part? It’s free because Apple built the camera into the Nano, and kept the price the same. And added an FM radio. And a speaker. And a pedometer. And voiceover. And voice recording. And a slightly bigger screen. Same physical size, same price. Crikey. And it was available immediately. In reality, it was available for order immediately, and only showed up at the local Apple Store on Thursday. A quick dash from work to the Galleria during lunch has put a nice electric reflective green iPod Nano in my hands. I love the new finish on the 5G Nanos -– very nice. However I’m inclined to think it’s a fragile finish. In fact, despite it being aluminum, the slick feel reminds me of a plastic case. And I don’t know if it’s that my hands are telling my brain that the thing is plastic, but the 5G Nano feels lighter than my 4G Nano. That’s gotta be some kinda subliminal thing from my fingertips to my brain’s weights and measures division. Speaking of fingertips, the slick feel of the case keeps making me feel like the little thing is gonna squirt out of my hands — it’s the same kind of feel my iPod Touch had. The FM radio works well enough, although the big ol’ building I work in blocks a lot of signals. BTW, you have to have the headphones plugged in for the radio to function -– it uses them as the antenna, and is aware when they aren’t attached. I’m using non-standard-issue Bose earbuds, and they seem to work just fine as the radio antenna, so it appears there’s no Apple voodoo going on requiring the use of the Apple headphones in order to use the radio. That’s a pleasant surprise after some the headphone wackiness that’s gone on lately from Apple. The video camera functionality is fun and actually seems to work pretty well. Uncle Steve said that there was one-button publishing to YouTube, with the implication that this would come through iPhoto. However, even in his presentation Wednesday, iPhoto didn’t have an icon for YouTube, and we never actually saw him upload a video anywhere, despite playing some YouTube hosted video shot with the 5G Nano. I’d wanted to post a new video on YouTube from the Nano, but have yet to get it to work. First off, I found no place for one click publishing to YouTube from iPhoto. Instead, I copied my videos to my desktop, and tried to upload one through YouTube’s web interface. To quote Janie Porsche, “Eeeehhhhnnnntttt!” I didn’t save Christmas, nor did I get a successful video upload. While the video appeared to upload, the backend processing never completed, and finally errored out. Not being satisified with that — and having a blockbuster video shot with my iPod Nano that I wanted to share — I tried uploading the video via Quicktime Pro. It does have a menu item for uploading to YouTube. Filled in the boxes, and once again, the upload finished, but there was no completion. In fact, I left it churning for about 10 minutes (for about 30 seconds of video) before mercifully ended the process’ life. I’m not a YouTube video expert, but to me, it seems like YouTube doesn’t like converting the Nano video stream into whatever it prefers. I like the video shooting capability, but so far, the one-click publishing to YouTube seems to be falling on its face for me. YMMV. Speaking of pulling video from the Nano, it appears that the only way you can access your video gems is to put the Nano in “disk mode”. I tend to slam my iPods in docks when I’m done with ’em, and pluck ’em out at a second’s notice as I’m headed out the door. In disk mode though, you can’t do that. You have to do an orderly eject from the Mac desktop or iTunes. While that’s not a real big deal, it does take longer, and it definitely doesn’t fit with how I’ve been using my iPods for years. A prediction: I will foul up that sequencing at some point, and toast the load on the new Nano, forcing me to go through a restore. The built-in speaker was a surprise the first time I accidentally hit play on a music screen while showing the thing to co-workers. The sound is tinny, of course — on a movie of my Bernese Mountain Dog, playback made her sound like Chihuahua — but the fact that it’s there at all is cool and is great for quick and dirty video sharing. The slightly bigger screen is nice. When playing tunes, the thing displays artist, album and title with no scrolling — a nice UI improvement. Not a big deal, but nice. I really thought the form factor would be different with all the new toys, but Uncle Steve says it’s the same form factor. The photos I saw early on made me think that the new Nano was a little thicker, and more squared off on the sides. That doesn’t appear to be the case. Obviously, there are changes to the case in order to accommodate the bigger screen and the camera on the rear. And in a brilliant move, the headphone and dock connector have swapped positions on the bottom, meaning new accessories if you have a toy that is strict about that sort of thing. Also, the capacity isn’t stamped on the case anywhere. That tells me Apple can stockpile cases, and put them on whatever capacity comes down the line. (C’mon Apple — 32GB would be sweet!!!) My guess is that the new case manufacturing process probably doesn’t lend itself to a quick turnaround. This way it doesn’t matter what comes next as long as the form factor is the same. iPhone OS Upgrade Is Here! Well, today was the day — the new iPhone OS was released, and I’ve pulled it down, dumped it on my iPhone and iPod Touch…. and I’ll see whether it was worth the wait. In a real quick spin through the screens, it doesn’t look or feel much different than the previous version. However, tomorrow will be my first real chance to see any differences, and it’ll be interesting to see what the real-world experience will be like. In reality, I wish I could get one of the new iPhone 3Gs phones that’ll be released of Friday. After checking with AT&T today though, I’m not eligible for a discounted upgrade until August of next year, and that means a difference of $200 (plus an $18 upgrade fee). It’s a crying shame, as I’d really like the faster network, as well as the higher storage capacity. When I bought my iPod Touch and iPhone, I was moving from an 80GB iPod, and I wanted something with a high storage capacity. And getting away from a hard drive was a good thing. However, the iPhone was only available as big as 16GB, and that wasn’t gonna cut it. Now, the iPhone 3Gs offers 32GB of storage, and that would allow me to do a little convergence of devices. But…. at $499, I’m pretty sure I don’t wanna be pulling the trigger on that right now! iTunes 8.2 Has Arrived, But Whither the iPhone 3.0 Update? I was thrilled to come home tonight to find that Software Update was bouncing, awaiting me with news of a new version of iTunes becoming available. And on the list of updates? Compatibility with the new iPhone 3.0 OS upgrade. But…. no 3.0 upgrade. Anywhere. Dunno why I’m so excited about the promised new upgrades for my iPhone and iPod Touch, but for some reason, I’m kinda jazzed about it. I don’t develop on that platform, and I haven’t done enough research to have a real good reason to move to 3.0. But, I know I will, as soon as it’s available. And I’ll probably find things to complain about. I know me well enough to understand my tendencies! Back in September, I mentioned that I voted with my wallet, preferring an iPod Touch over an yellow iPod Nano. Well, the pressure of Black Friday sales weighed heavily on my shoulders, and come that fateful Friday, I ordered an 8GB yellow Nano. I’m very impressed with the little thing. It’s tiny. Despite that, it has a decent sized screen, although I don’t know if I’d wanna watch video on it (something I haven’t tried yet). And it weighs next-to-nothing, while sporting a glass screen and an aluminum body. It’s really a thing of beauty. So why did I need a third iPod? Aside from being a sucker for the “on sale” high sign from Apple, I decided that having a device with some resilliancy would be good for yard work, hiking, etc. My Touch is a fine device, but it’s a bit bulky for some environments, and I’m a little concerned about breaking its screen in the great out of doors. 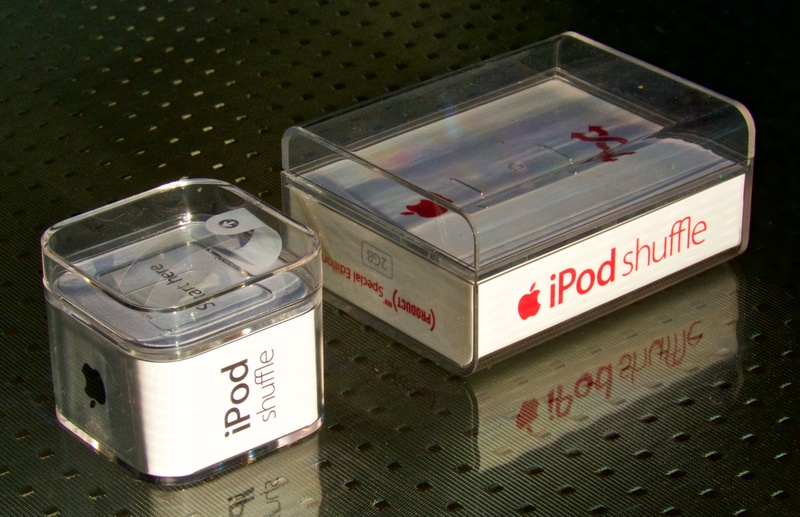 Last week, I hinted that there might be a new iPod Nano in my future. A yellow one, in fact. I even put the mock ups of the engraving as a teaser. That didn’t exactly happen. I’d ordered a yellow Nano over a week ago, thinking that I’d have it before this week end. It kept not shipping, and not shipping, and not shipping, so on Thursday, I grimaced in pain, and cancelled the order. Now I didn’t know what to buy — a 16GB Nano or a 32GB Touch. Off I went camping Thursday night, still twisting over what to buy. Come Saturday morning, I drove to the Apple store after confirming they had both models in stock, and even driving into the parking garage, I still hadn’t made up my mind. After spending the better part of 30 minutes with the Apple dude, I walked out with an iPod Touch. It’s a nifty little box… small, light, and has a huge screen. Frankly, I’ve been spending more time getting video material ready for it, as opposed to music. It’s definitely gonna be a different world for me — I’m used to having every piece of music I own with me, and 32GB simply won’t give me that. So far, I’ve got nothing but good to report on the little device, and it looks like my most listened to music is gonna fit. The biggest bugaboo has been video. Videos that used to work on my 5G 80GB iPod don’t seem to wanna work on the new device, and videos formatted for AppleTV out of TubeTV no longer seem to wanna work with the new gear. It’s just a guess, but I’d venture there’s some kind of flag being set somewhere that’s disallowing this. We shall see. Stay tuned as I play with all the goodies this thing’ll do! Twenty-four hours after I believed I had cratered my iPod whilst trying to restore it resale, it appears to have come back to life, fully functional, and back at factory defaults. Here’s what transpired. From iTunes 8, on both my MacBook and MacPro, I tried to restore my 5G iPod to its original state. From both machines, I got the message Ipod could not restore. An unknown error occurred 1418. And after the last time it happened from the MacBook, the iPod would no longer function. It acted as through the firmware or hard drive were corrupt, leaving the iPod in a state where it couldn’t be seen by iTunes, and couldn’t be seen by either of my Macs or Darla’s Windows XP machine or my VMWare XP environment. After a lot of frustration, I wrote the thing off as a loss. Tonight, Apple had an OS upgrade sent out, and I thought it’d be worth a try to see if that upgrade would help any. It didn’t. I saw the same things. I googled my error message, along with some other pertinent keywords, and I found someone describing how a hard drive replacement is done in an iPod, and he mentioned Disk Mode. Disk Mode allows the iPod to act like a portable hard drive to the OS, and was mentioned by Apple as one way to help force a restore of the iPod. This guy had figured out the hidden iPod command keystrokes necessary to do a hard reset of the iPod (Select+Menu), enter diagnostic mode (Select+Play/Pause) and enter disk mode (Select+Prev). Upon the reboot from diagnostics, I held down Select+Prev…. and there was Disk Mode! I plugged the iPod into the MacPro, and the MacPro promptly complained about the hard drive being in some funky unformatted state. This was the first time in 24 hours that my iPod had been recognized by any system. Leopard was even nice enough to offer to format the drive, which I politely declined, favoring instead to let iTunes manage putting the Hands of Steve on my iPod, exorcising its demons. I cranked up iTunes, and it promptly told me that I appeared to have a damaged iPod, and that it would be happy to restore it. I allowed it, iTunes starting shoveling bits down the USB cable, and in just a couple of minutes, my iPod was whirring happily, charging, and being the happy little dude it used to be.